The Pacific is an ideal area to visit and enjoy beaches of volcanic sand, find natural reserves where marine turtles, iguanas and crocodiles live, as well as enjoy a relaxed coastal environment and rest where its magnificent beaches span more than 300 kilometers allow surfing and other water sports. It is the largest recreational holiday resort in Guatemala. It currently has two theme parks: Xetulul and Xocomil, which offer visitors various activities. Xocomil, is a water park that is located in the middle of an exhuberante vegetation. The park’s architecture is influenced by the Mayan culture, which makes the park an impressive place to enjoy and admire. 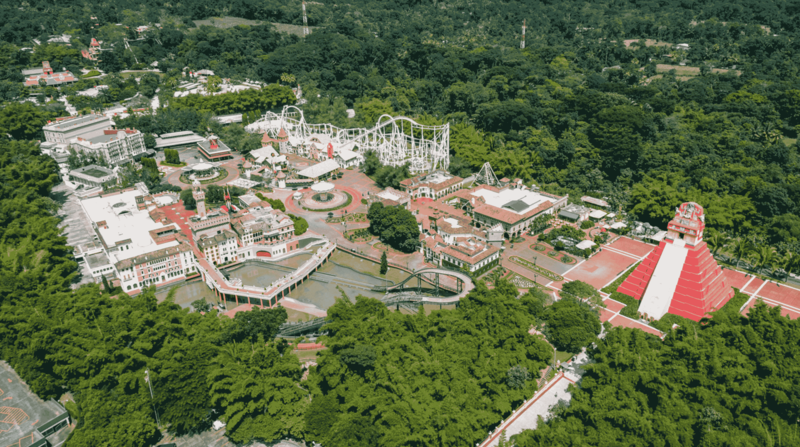 Xetulul, is a park with different distractions, where you can find restaurants, rides, playgrounds, arcade games and different magic shows and dances in the park theater. This destination is ideal for family visits, where relaxation and entertainment activities can be found through the different hotels located in the area. The ancient city of Tak’Alik Ab’Aj, which in K’iche ‘, means “standing stone”, played an important role in the trade of the region, maintained a very prolonged occupation from the Middle Pre-Classic to the Late Classic period and maintained very important contacts with other contemporary groups such as the Olmecs on the Gulf Coast of Mexico. Tak’alik Ab’aj is one of the most important settlements on the Guatemalan south coast and has managed to preserve the central part of the settlement in excellent conditions allowing the investigation and restoration of its main architectural manifestations and registration of its many monuments that present styles Olmeca, Maya and a local style. That is why, it can be characterized as on the threshold between the Olmec and Maya cultures. To date, more than 70 major buildings, 204 carved monuments and 3 jade masks have been found, demonstrating the majesty of its ancient inhabitants. A few years ago the burial was found which is believed to be one of the last rulers of Tak’Alik Ab’Aj, arranged in alignment to the Draco Constellation, which featured one of the largest offerings with more than 200 vessels and artifacts. At present it is a ceremonial site of great importance for the current inhabitants, who come to him to request blessings for their crops and family, during important dates such as the Mayan New Year. Located in Retalhuleu, the Xulik Toy and Superhero Museum exhibits more than 1,200 original figures of superheroes from Marvel Comics and DC Comics; in addition, 20 statues of the size of a person and original articles that were used in cinematographic productions. Each area has been set with a set design similar to that of the movies and each figure can be seen in detail, you can see photographs autographed by actors who personified the Spiderman, Batman and Hulk, among others. The walls are covered with gigantic reproductions of comic covers. Most of the items on display were purchased from collectors, autograph hunters and contacts in Hollywood, California, United States. In this same location we can find the Dino Park, which is a park with animatronic dinosaur themes that move, have gestures and have sounds, all in a natural and specialized environment to make the ride a unique experience. It is located at kilometer 81 of the CA-2 route in the jurisdiction of Guanagazapa. This zoo type safari, has animals of diverse origins being a pleasant place for children and adults. In addition, it offers recreational services and facilities. It is located between the department of Guatemala and Escuintla. It has a height of 2,552 m.s.n.m. In the central eastern region of the volcano there are five rounded cones, the first cone is the “Cheese Leaf” that is on the shore of the Calderas Lagoon. The second cone is the “Black Hill” that is north of the main or active cone. The third cone is “Cerro Chiquito” which is northeast of the main cone. The fourth cone is the “Cerro Chino”, which is to the south of the main cone. The fifth cone is the active cone or Pacaya volcano. It is important to indicate that the active crater that the Pacaya massif has, is named after the Guatemalan doctor Alfredo MacKenney, who has made more than 1,200 ascents since 1965 and for the follow-up he has given to the evolution of this volcano. In the volcano you can perform different activities such as canopy, horseback riding and hiking. This is one of the major tourist attractions of Guatemala, so artists such as Maluma, Piso 21, Wizard of OZ, Skrillex, have conquered this peak. 51 km away of Escuintla, offers black sand beaches with hotel complexes, in addition, the Pacific Coast, offers one of the best places in the world for the realization of sport fishing, especially the Sailfish. The peculiarity of the Pacific beaches of Guatemala is the color of its sand, which are black, it is because they have volcanic sand and this causes the sand to heat too.